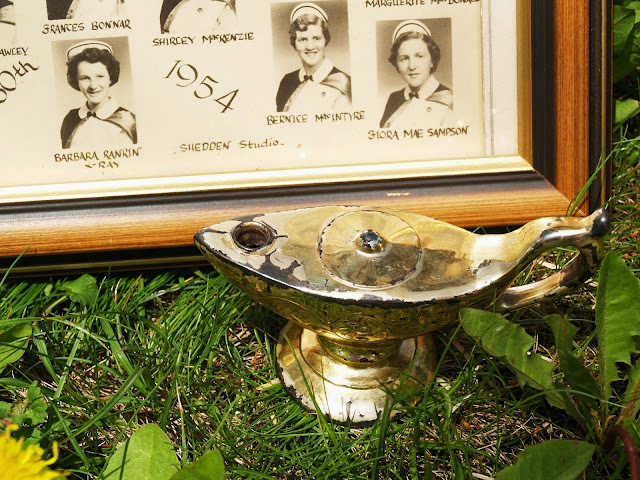 National Nursing Week was last week, so I'm a bit late, but I was looking at some of my mom's nursing school memorabilia on the weekend and thought it would be a fitting tribute to post a couple of photos. Thank goodness for the people who want to be nurses, right? That's not me, which makes me appreciate what they do even more. Mom graduated from Saint Joseph's Hospital's Nursing School in Glace Bay, Cape Breton Island, Nova Scotia in 1954. She was just 19 at the time. She showed me this lamp, which she received after completing her 6-month probationary period. 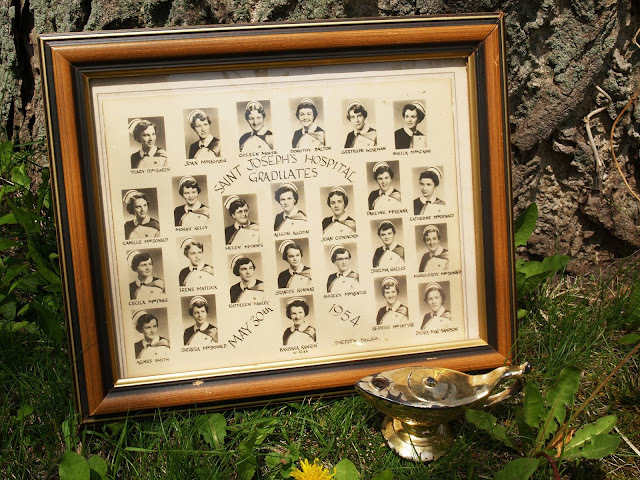 Several of the girls in her class became ill with tuberculosis and had to leave school to recover. The TB sanatorium was near the hospital and clearly there was cross-contamination. The lamp is reminiscent of that of Florence Nightingale, who laid the foundation for modern professional nursing with the creation of the first secular nursing school in the world, now part of King's College London. During the Crimean war, Nightingale got the nickname "The Lady with the Lamp" from a phrase in a report in The Times: "When all the medical officers have retired for the night and silence and darkness have settled down upon those miles of prostrate sick, she may be observed alone, with a little lamp in her hand, making her solitary rounds." 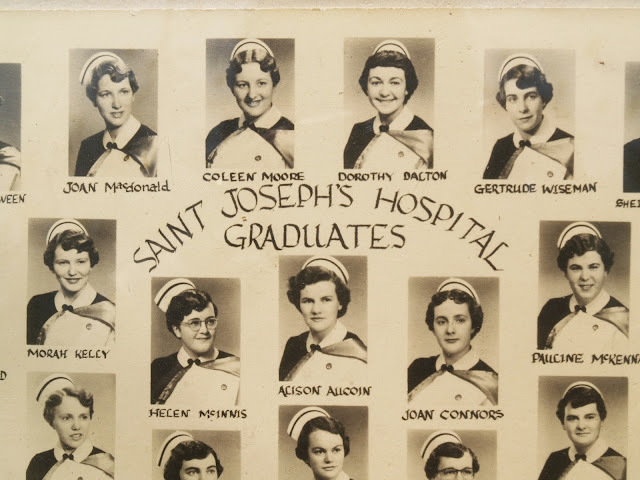 Mom didn't want me to include her individual grad photo, but there she is at the top, "Coleen Moore." (They spelled Colleen wrong.) Isn't she pretty? And I love the way all those young ladies did their hair in those cute curls. I bet it wasn't easy finding the time, seeing as they worked in the hospital all day and had classes in the evening. A belated happy National Nursing Week to all the nurses! Do you have a nurse in your family? What a lovely Post! Colleen looked beautiful! I also love the hairstyles! What a nice tribute! The hairstyles of the day were great! How DID THEY DO THAT? Thank You Jo for hosting Vintage Bliss 35 and writing about your Mom. Nurses are so essential. Mom is just as beautiful today as she was then. Hooray for nurses they really give there all. Joann, that was so nice to share about your mom and the tribute to nurses. Aww I was born at St. Joe's but in NJ! My sister in law is a nurse's aid I don't know how she does it!